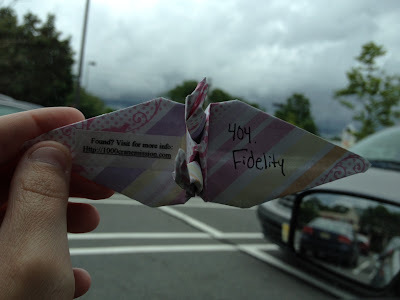 There is something about the word fidelity that I just love. And not because it is an investment company (although that was a very good choice of company name based on the definition!) I don't often hear fidelity used very often so I tend to appreciate it when it is. Perhaps it's the way that I say it, but it has a lot of meaning behind it and it carries weight to me. Do you have a word that you just love or appreciate? EDIT:// This crane was found on 6/4 by Tom, a UPS store employee. In his email, Tom said, "I found it while I was cleaning and was surprised to see your website and what you are trying to do. It was also funny because we were wondering where it came from. Thank you for all that you do."